Why Do Dress Shoes Have Leather Soles? Designers these days use leather for most dress shoe designs. Leather is known to hold many inherent benefits, making it a far better option for shoe soles than rubber and alternate synthetics. Leather soles are clearly superior, molding to the form of your feet and the overall design of a good dress shoe wonderfully. 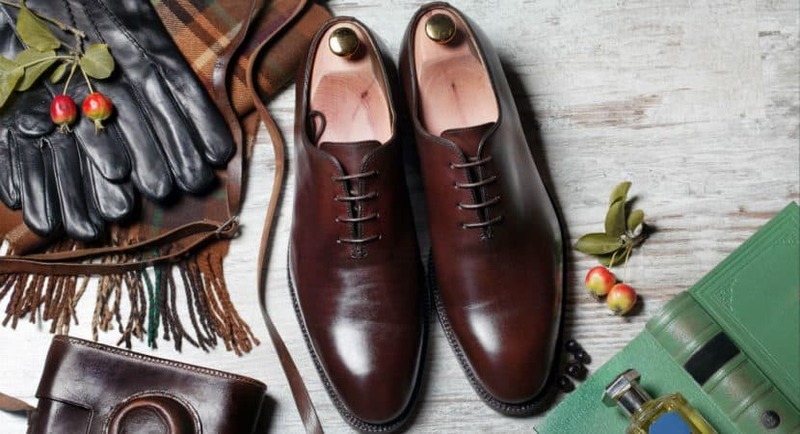 On this page we’ll explain why all the best dress shoes have leather soles, and what makes leather soles the ideal choice both practically and stylishly. Good men’s and women’s dress shoes are elegant, stylish and have a high overall standard of construction. Leather soles are a hallmark of quality which you should always stay on the lookout for. A leather sole delivers the epitome of elegance, with the fine lines and compressed sole matching the sleek lines of a well-designed dress shoe. You can’t beat the way that a leather sole matches the shape of your shoe, while their thin nature is equally as appealing. As extra layers of leather are applied to craft a sole, the strength and durability drastically increase. Triple leather soles are known to outlast any form of rubber. Always look for multiple layers of leather, as the gains are exponential. Rubber is quite durable if the correct quality and composition are obtained, but extra layers of leather guarantee a longer-lasting shoe. Rubber soles are known to crack without any apparent cause or reason. If the rubber dries out, as often happens when leaving your shoes to dry in front of a radiator after getting wet, then it is likely that a sudden crack or array of cracks will form. Once a crack starts it spreads rapidly. Leather slowly absorbs water through tiny cracks or busted seams, but once it has dried out it will compress and retake its form. The longevity is far better than rubber. Rubber heats up at a far more rapid rate than leather, translating to warmer shoes, especially when you are on your feet for long periods of time or are very busy. Similarly, dress shoes featuring leather soles are also the best option in areas where it is very warm and dry. Your feet stay cooler and the breathability is far better when opting for leather soles. Thanks to the breathability of a leather sole, your feet are far less likely to accrue any form of fungal infection caused by dampness and sweat. In a similar manner, odor-causing bacteria are not given an environment to breed which also drastically reduces the chances of smelly feet. Leather soles are not only the more stylish option, they are also the most hygienic. Dress shoes with leather soles can be resoled when necessary. Most high-quality dress shoes are so well-manufactured that they are sure to give you many years of service without their appearance suffering. Leather dress shoes are actually known to improve in appearance over time. The only thing which typically takes damage after years of use is the sole. Fortunately, leather-soled dress shoes can be easily resoled at a very low cost by any reputable cobbler. In addition, the stacked leather heel can also typically be replaced separately, should it become necessary. Leather has a break-in time during which it will adapt to the unique contours of your feet. While this can take several weeks, once your leather soles are broken in, they will give a customized fit which grants you superior traction on sheer, smooth surfaces and even on areas which are wet. The more often you wear your dress shoes, the more they adapt to the form of your foot. Nothing is more comfortable than leather soles once they have been broken in. Many wearers report that they vastly prefer the sound of a leather sole clicking on the ground beneath them over the sound of rubber squeaking and screeching. Shoes with leather soles feel better to wear as well, thanks to the leather taking an impression of your foot. Many entertainers, especially dancers, attest to the fact that their sport is only possible in leather shoes. Your feet still “feel” the floor, while the sound of contact itself is pleasing. Yes, leather soles can be coated with a thin layer of rubber if you really want. Many insulating coatings are readily available to add that extra layer of grip to slippery shoes. Just keep in mind that your shoes will never really get broken in, developing the true traction that is inherent to well-worn leather. Certain types of rubber are prone to leaving scuff marks. You can wear your leather-soled dress shoes on any surface from the moment you take them out the box without every worrying that you are going to scuff or mar a wood or stone floor. Leather-soled dress shoes are far lighter than shoes with rubber soles. The slimline, sleek design of a stacked leather sole gives it better performance than that of far thicker rubber while granting a better overall feel as well. A high-quality pair of dress shoes will be extremely lightweight and thin, displaying elegance and attention to detail in every aspect of design. A bulky, complex patterned tread simply does not work. Rubber soles are not suited to dress shoes. They are perfectly fine for a practical or exercise shoe worn with casual attire. Rubber can give you better slip resistance and is far hardier to the elements, but this comes at the cost of style. If you want the best pair of dress shoes possible that clearly convey superior style and quality from the moment they are seen, then you need to get a pair with leather soles. A good pair of shoes could last you a lifetime, making the cost of resoling near negligible once the need eventually arises. Always look for leather.